However, this idea has challenges. First, the amount of solar energy entering the atmosphere at the time was considered to be too low to support a warm and wet climate. 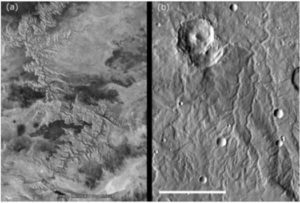 Secondly, recent climate studies have argued that Mars’ ancient fluvial features can be accounted for with an icy climate, where widespread surfaces of ice promoted cooling by reflecting solar radiation. Occasional warming events would have triggered large amounts of ice-melt, and fluvial activity as a result. However, Ramses Ramirez (Earth-Life Science Institute, Japan) and Robert Craddock (Smithsonian Institution, USA) suggest that early Mars was probably warm and wet, and not so icy, after a careful geological and climatological analysis revealed little evidence of widespread glaciation.